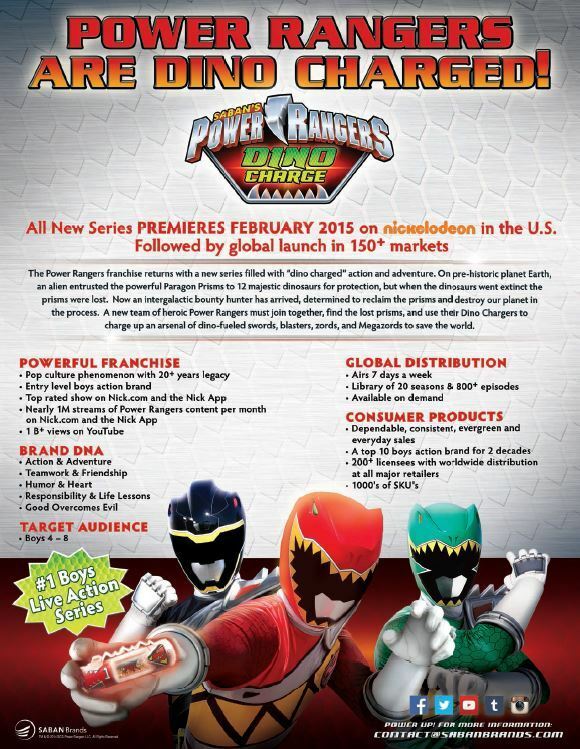 New images and info on the 2015 Power Rangers season. 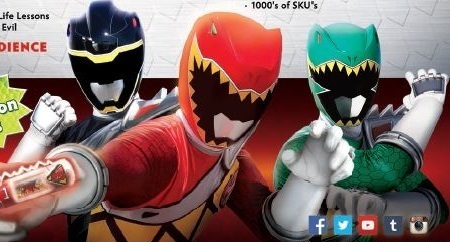 The next season of Power Rangers, entitled Power Rangers Dino Charge, was announced this weekend, and thanks to Rangercrew, we now have the official press release and promotional poster. The season will premiere in February of next year. Before then, you can catch the premiere of Power Rangers Super Megaforce this Saturday at 12p.m./11c on Nickelodeon, or watch the first episode right now on Nick.com! LOS ANGELES, Feb. 9, 2014 /PRNewswire/ — Saban’s Power Rangers get charged in the next season of the iconic franchise, Power Rangers Dino Charge. Debuting on Nickelodeon in 2015, this new season will deliver all-new dino-fueled action and adventure to fans of all ages. The series will roll out globally later that year. In addition, Bandai America Incorporated will continue to act as the global master toy licensee for the franchise, creating an all-new dinosaur themed product line. On pre-historic planet Earth, an alien secretly entrusted the powerful Paragon Prisms to 12 majestic dinosaurs for protection, but when asteroids hit and the dinosaurs went extinct, the prisms were lost. In Power Rangers Dino Charge, set in present day, an intergalactic bounty hunter has arrived, determined to locate the prisms, harness their power, and destroy Earth. To face this threat, a new team of heroic Power Rangers must join together, find all of the lost prisms, and use their prehistoric energy to charge up an arsenal of dino-fueled swords, blasters, zords and Megazords in order to save the world! Until then, fans can watch the new season, Saban’s Power Rangers Super Megaforce, premiering Saturday, Feb. 15, at 12:00 p.m. (ET/PT) on Nickelodeon in the U.S.
For more information on Power Rangers, please visit www.powerrangers.com and follow the brand on Facebook, Twitter, YouTube and Instagram. Saban Brands will launch the next installment of its Power Rangers franchise, one of the top-rated and longest running boys live-action series in television history, with Power Rangers Dino Charge. The new season, which will premiere in the U.S. on Nickelodeon in early 2015, will deliver thrilling “dino charged” action, adventure, humor and excitement in addition to core themes of friendship, teamwork, responsibility and helping others. 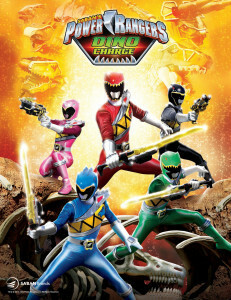 Power Rangers Dino Charge will introduce a new team of Power Rangers who must band together, find powerful ancient prisms and channel their inner dino spirit energy to charge up an array of dino-fueled swords, blasters, zords and Megazords to save the world from evil. The Power Rangers franchise is helmed by Haim Saban, who created and produced the original Mighty Morphin Power Rangers series in 1993. SCG Power Rangers LLC, which licenses and merchandises the Power Rangers brand, is an affiliate of Saban Brands. For more information, visit www.powerrangers.com. Formed in 2010 as an affiliate of Saban Capital Group, Saban Brands (SB) was established to acquire and develop a world-class portfolio of properties and capitalize on the company’s experience, track record and capabilities in growing and monetizing consumer brands through content, media and marketing. SB applies a global omni-channel management approach to enhancing and extending its brands in markets worldwide and to consumers of all ages. The company provides full-service management, marketing, promotion and strategic business development for its intellectual properties including comprehensive strategies unique to each brand, trademark and copyright management and enforcement, creative design, retail development, direct-to-consumer initiatives and specialized property extensions. SB is led by a superior management team with decades of experience in media, content creation, branding, licensing, marketing, digital and finance. SB’s portfolio of properties currently includes Power Rangers, Paul Frank, Digimon Fusion, Julius Jr., Popples, Vortexx, Zui.com and The Playforge. For more information, visit www.sabanbrands.com.